Kodak has released a new all-in-one printer, the Kodak ESP 5 that has print, scan and copy capabilities. The ESP 5 uses a 2-cartridge system of a full black cartridge and a five-ink color cartridge. The black cartridge retail for $9.99 while the five-ink color cartridge retail for $14.99. It will utilize a 2-cartridge setup consisting of a full black cartridge and a five-ink color cartridge which retail for £6.99 and £9.99, respectively. I personally prefer the older Canon cartridges that use individual color tanks since those will help you save money in the long run. The retail price for the ESP 5 printer is $169.99. ROCHESTER, N.Y., April 24 — Eastman Kodak Co. continues to change the way the world prints at home with its new Kodak ESP 5 All-in-One (AiO) Printer (see datasheet). The newest device in Kodak’s consumer inkjet printer portfolio offers the latest in design and performance, providing a high quality, easy-to-use printing system at a significant value. It leverages Kodak’s premium, low-cost ink that allow consumers to print more photos and documents for their money. 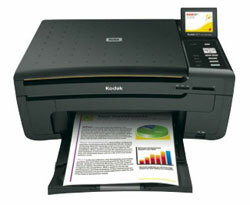 The Kodak ESP 5 AiO Printer ($169.99 U.S. MSRP) features a small, sleek design with print, scan and copy capabilities. It has a large 3″ color LCD display along with memory card and USB slots to allow consumers to view, edit and print with or without a computer. The Kodak ESP 5 uses Kodak’s high-quality pigmented inks that come in a simple two-cartridge setup — a full black cartridge ($9.99 U.S. MSRP) and a five-ink color cartridge ($14.99 U.S. MSRP). Kodak continues to expand its global reach. With its revolutionary inkjet business model and groundbreaking consumer value proposition, Kodak has added additional premier retail accounts to its international distribution channel including consumer electronics, office superstore, warehouse and mass merchandising outlets. New retail partnerships in existing markets include Target Retail Department Stores in the U.S., as well as London Drugs and Canadian Tire in Canada. Beginning in the second half of 2008, Kodak will broaden its current distribution network of more than 8,000 retail stores by expanding into Latin American countries. A leading industry research firm, QualityLogic, Inc., recently conducted tests of ink yield of Kodak AiO printers and other leading consumer inkjet printers. The results confirm that one year after launch Kodak AiO Printers continue to offer consumers the best ink value compared to competitors’ similar consumer inkjet printers. Kodak estimates that consumers who use Kodak AiO Printers can print up to twice as many pages for every dollar spent on ink compared to the industry average. Recently the printers were tested extensively by a leading independent permanence testing laboratory, Wilhelm Imaging Research. According to the results of the industry’s first five-factor print permanence test, spearheaded by WIR, the Kodak AiO Printers and premium pigment-based ink achieved the highest level of overall print permanence of any current consumer desktop printer system tested by WIR. The Kodak AiO Printers, ink and media achieved WIR Display Permanence Ratings and Album/Dark Storage Ratings of greater than 125 years. More information about the results of Wilhelm Imaging Research and QualityLogic findings regarding Kodak EasyShare Inkjet Printers and Kodak’s advanced pigmented inks and papers can be found at http://www.Kodak.com/go/inkdata. * Savings based on ink costs only for home printing of documents and photos, compared to the average ink costs of comparable consumer inkjet printers. Actual results may vary. For more information visit http://www.Kodak.com/go/inkdata for details.